Successfully Added HK Warehouse Ulefone MIX Android Phone - Android 7.0, Bezel-Less, Dual-IMEI, 4G, 13MP Dual-Rear Camera, 4GB RAM (Black) to your Shopping Cart. Enjoy an unlimited visual experience on the bezel-less display of the Ulefone MIX Android phone. With its stunning 5.5-Inch edge-to-edge display, this latest Android phone treats you to crisp 1080p visuals. Thanks to this, you’ll be able to enjoy films, series, and games in vivid color and absolutely stunning detail. You will be treated to 64GB internal storage and 256GB SD card support. Therefore, you won’t have to worry about running out of storage any time soon to keep your files and media. Underneath its beautiful screen, this Android smartphone packs the MediaTek MT6750T processor and 4GB RAM. This hardware brings along enough power to let you tackle demanding Android applications without dropping a frame. No matter the type of media you enjoy, the Ulefone MIX smartphone is sure to meet your demands. A whopping 3300mAh battery is in place to treat you up to 5 hours of continuous usage time. With this cell, you’ll get through the most demanding of days without needing to worry about running out of juice. The Ulefone MIX Android phone comes with Dual-IMEI numbers and 4G support for extra connectivity. You’ll be able to slide in two SIM cards and stay connected to both at the same time. With its 4G network support, this Android 7.0 smartphone lets you browse the web wherever you are. The phone even comes with a 13MP Dual-Rear camera that lets you shoot breathtaking images and Full-HD video. Thanks to the phone’s mobile network capabilities, all your personally snapped pictures and film can now be shared instantly with friends and family over social media. 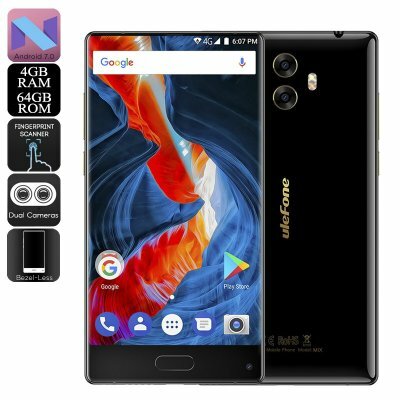 The Ulefone MIX Android Phone comes with a 12 months warranty, brought to you by the leader in electronic devices as well as wholesale smartphones..